Last year teams in the 12-U Douglas County Amateur Baseball Assn. didn’t get to play their postseason tournament because rain postponed games. Playing the tournament would have resulted in playing games so late in the summer that they would have conflicted with state tournaments. This summer DCABA teams, especially pitching staffs, embraced the June 30 rain that paused the DCABA postseason tournaments last week. Nathan Peterson, left, talks with pitcher Nathan Herries between innings of an 8-U Douglas County Amateur Baseball Assn. game against the Jets on June 27 at Douglas County 4-H Fairgrounds. The rain may have put a damper on teams’ hopes for finishing the DCABA season before the Fourth of July holiday, but it had its perks for pitchers, who are usually restricted by DCABA rules. The regulations state that pitchers are limited in the number of pitches they can throw and how frequently they pitch. In the 10-U age division, a pitcher can throw no more than 55 pitches in a 70-hour time period. In the 12-U division, pitchers are limited to 75 pitches in the same time period. 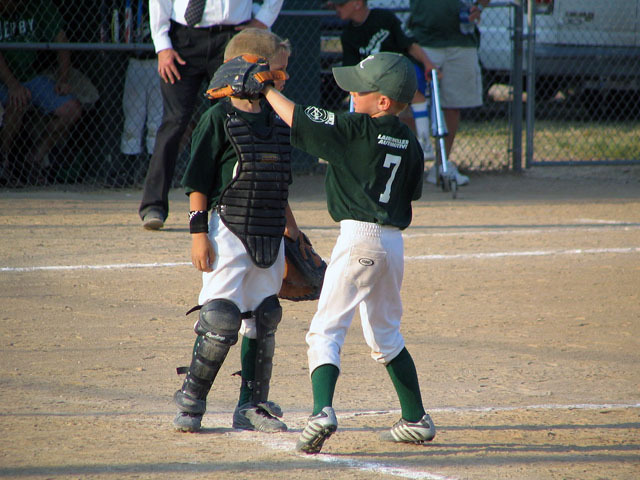 Each team keeps a pitching record that can be presented to the umpire and coaches upon request before the game. These rules present coaches with strategical challenges. They don’t only try to save their best pitchers for the tournament, they also hope to have enough pitchers. Because the tournament setup in some divisions called for four games in as many days, many teams would have been stretched to find enough eligible pitchers. Some teams, such as the Cardinals, had league games within the 70-hour window of when the tournament began, which affected who they chose to pitch in their game against the Athletics in their final league game of the season. “Because we are playing so many games in a row, we have to save pitchers so we have enough for the tournament,” Cardinals coach Brad Walthall said. Rules are not the only factor limiting players’ performances. Playing many games with little rest in the summer heat takes a toll on players. The Angels have instituted the “no-pool rule” that encourages players to not go swimming the day of a game in hopes that they will have more energy. Angels coach Bud Stagg, who is also in charge of communications and scheduling for the league, said his team has had better focus and played better baseball since implementing the rule. The postseason tournament also provides a chance at redemption for many teams who were not satisfied with their regular-season performance. It gives teams another chance to capture their age division’s title. Despite a 3-11 regular season record in the 10-U age division, the fourth-place Royals had another shot at the league title with the tournament. “It’s neat because a fourth-place team has a chance to win the league,” Stagg said. Because rain canceled games June 30, games scheduled to be played that day were made up Tuesday, and the final games are scheduled to be played today.